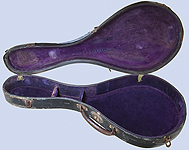 NMM 13563. 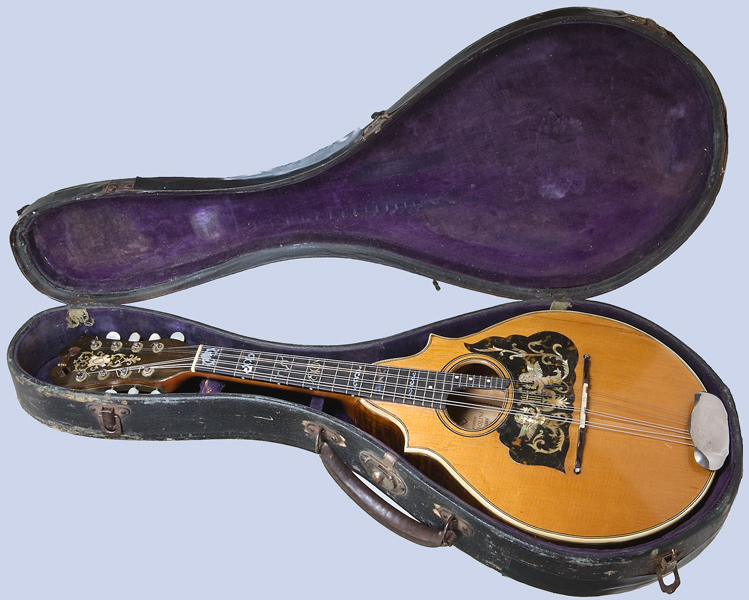 Mandolin attributed to John D'Angelico, for his uncle, Raphael Ciani, New York, ca. 1921. Tony & Bonnie Vinatieri Family Trust, 2008. Body: Stringing: eight steel strings. Soundboard: one-piece spruce, medium grain; slightly bent. 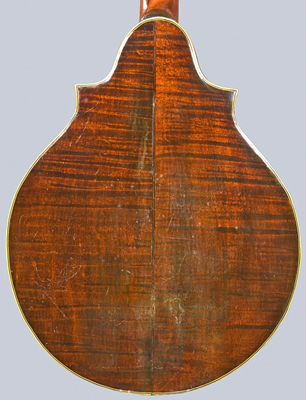 Back: two-piece maple cut off-the-quarter; medium, horizontal curl; slightly bent; strip of purfling along center joint, slightly to the treble side of center. Ribs: four-piece maple cut off-the-quarter; medium curl. Neck: mahogany, integral with head. Binding: white celluloid on top; white ivoroid on back; three-ply, black-white-black celluloid strip trim on front, back, and ribs. 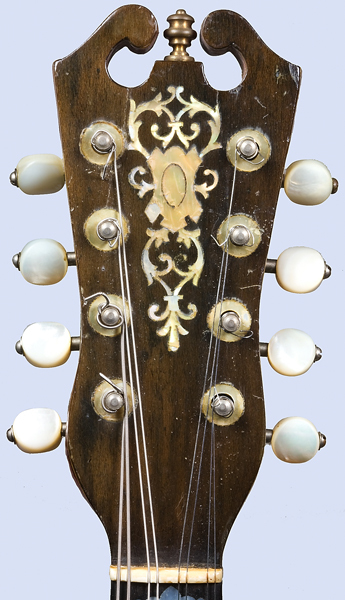 Bridge: ebony; bone saddle with string offsets set into top; ends terminate in separate guitar-pin heads with abalone eyes glued to top. 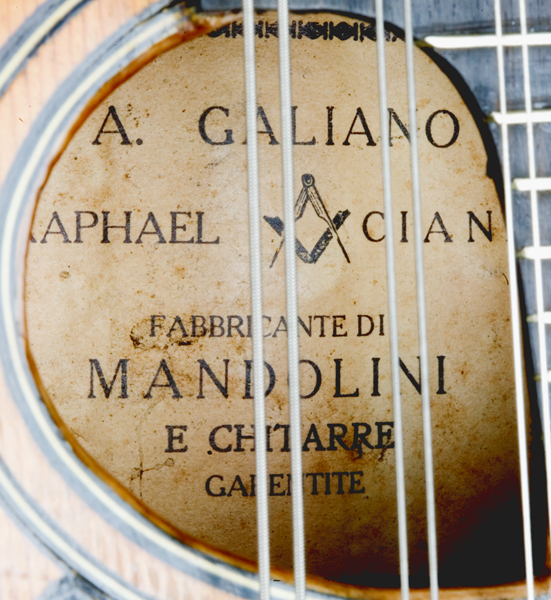 Rosette: two rings of black-white-black-black, four-ply celluloid purfling with space between; soundhole bound on inside with tan-colored ivoroid. Pick guard: imitation tortoise-shell celluloid with extension on treble side; inlaid with two abalone angels playing a lyre and foliate design; lyre strings made from inlaid white celluloid strips. 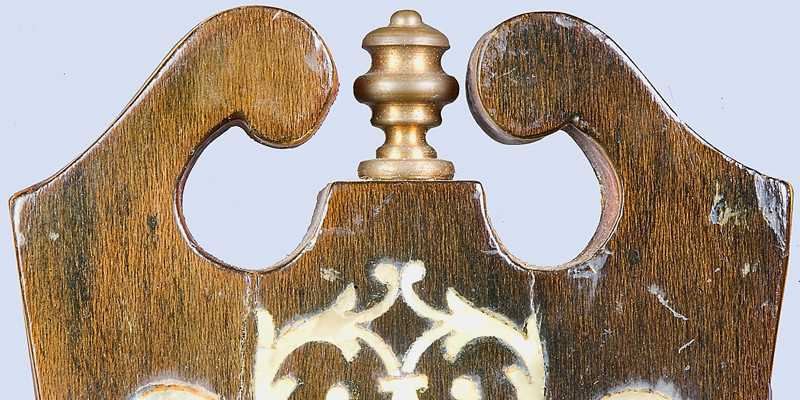 Tailpiece: nickel-plated steel in shape of armrest. Lacquer: clear on front; brown stain on back, ribs and neck. 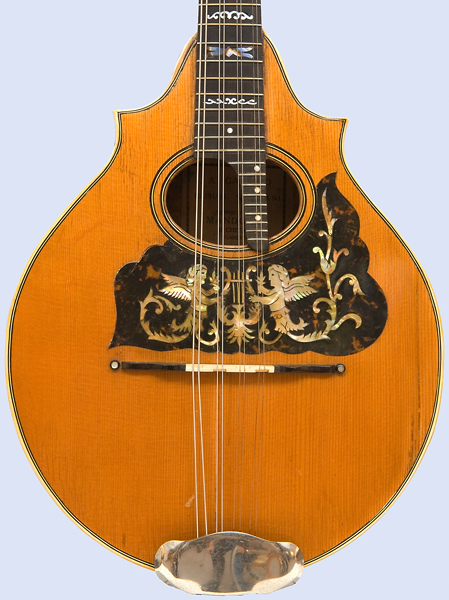 Head: mahogany; broken pediment-style with turned, brass ornament; veneered with dark-stained hardwood over light and dark-stained layer (purfling not cut into strips); abalone foliate inlay of identical design to that on NMM 10772, plectrum guitar by John D’Angelico, 1937. 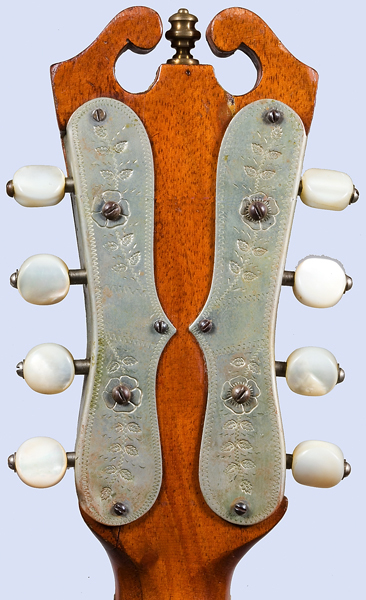 Tuners: two pairs of nickel-plated steel, inset worm-gear machine tuners with mother-of-pearl heads and nickel-silver plates with engraved and impressed floral designs. Fingerboard: ebony; 20 nickel-silver frets under D and G strings; 20 nickel-silver frets under A-string; 28 nickel-silver frets under E-string, this section of the fingerboard over a spruce extension bridging the soundhole; foliate mother-of-pearl inlay behind 1st, 3rd, 10th and 15th frets; foliate abalone inlay behind 5th, 7th, and 12th frets; single mother-of-pearl dots behind 17th, 20th, 22nd, and 25th frets; mother-of-pearl side dots behind 3rd, 5th, 7th, and 10th frets. Nut: bone. Heel cap: dark-stained hardwood; set in from back. 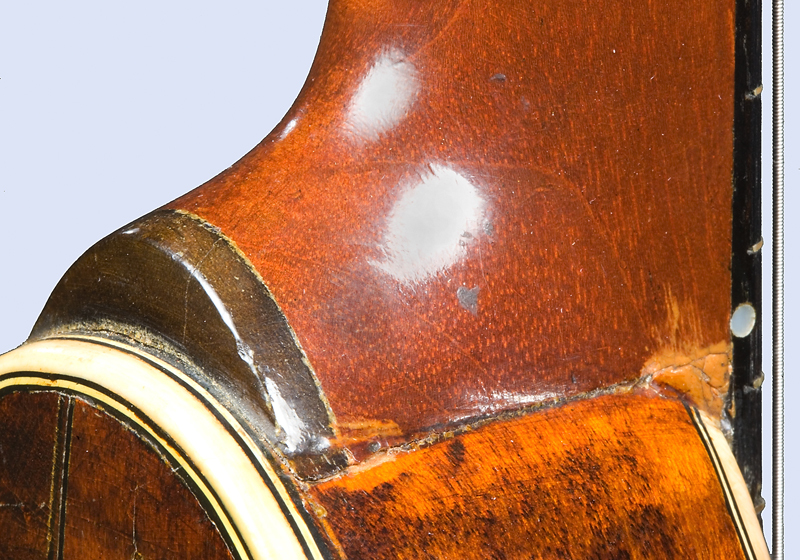 Linings: thick spruce in upper bouts; changes to kerfed maple about one inch below corners. Corner blocks: dark-stained hardwood, probably maple. 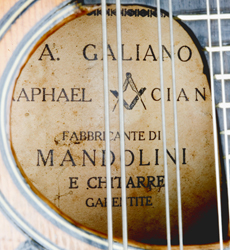 Neck block: mahogany or Spanish cedar; grain runs parallel to plane of top and back. End block: ebony; wide; shallow. 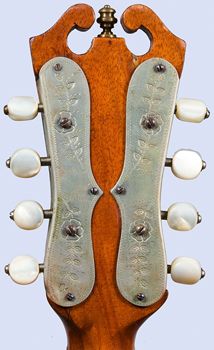 Top braces: four large spruce braces set into linings, three below soundhole, one above soundhole. Back braces: four large spruce braces set into linings; wide maple back graft; upper spruce brace cut down after being set into linings. 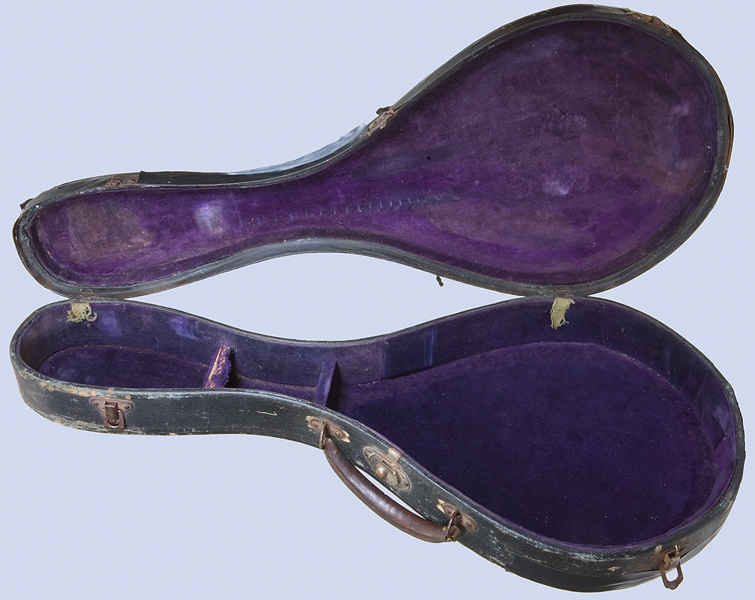 Case: Plywood case covered in black, imitation-leather-texture canvas with purple cotton-velour lining, nickel-plated steel and brass hardware, and steel handle.